Year round water with dock-able land. The lake is about 26 miles long and 7 miles widest at its widest point. 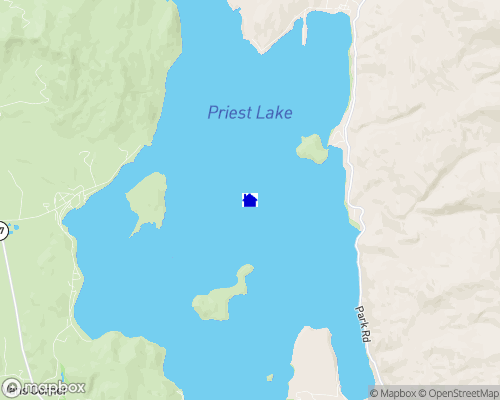 There is a small lake, upper Priest Lake, that is boat accessible through a 4 mile thoroughfare. Jet skis are allowed. The lake is very clean and clear and is very good for swimming and water skiing. Sailing is a popular summer activity. Summer and Winter levels vary about 2 feet. Boat docks are permitted along with Shore Stations and this listing includes a Shore Station that will accommodate a 21' boat. Power boats are permitted and it is very common to see kayaks and canoes. The lake is about 350' at its deepest point. Nearby cities: The nearest communities are Spokane, WA and Coeur d'Alene and Sandpoint, ID.